In this short blog post we wanted to outline some basic information about the dangers of acids and bases and how they can affect humans. Acids and bases are corrosive substances that can attack various surfaces including human tissue. The amount of tissue damage they cause depends on the strength and concentration of the acid or base and the duration of exposure. How reactive an acid or base is with water determines its strength. Strong acids readily give up hydrogen ions (H+) in water, meaning they have a high degree of ionisation. Molecules of strong bases easily dissociate in water to donate hydroxide (OH-) ions. The strongest acids and bases dissociate completely in water and have the highest degree of ionisation. Weak acids and bases dissociate very little in water and do not give up many ions. Where the pH is less than 4 an acid would be considered ‘strong’ and likely to cause chemical burns. Common strong acids include hydrochloric, nitric, sulfuric and phosphoric acids. Weak acids such as acetic, citric and carbonic are not generally corrosive unless they are in greater concentrations and can safely be consumed and do not irritate the skin. Acids can react violently with water and are harmful in the presence of moisture in the mouth or eyes or in proximity with other aqueous solutions. Vapours from some acids are soluble in water and can cause damage to the eyes, nasal passages, throat and lungs. Burns from acids tend to be felt straight away. 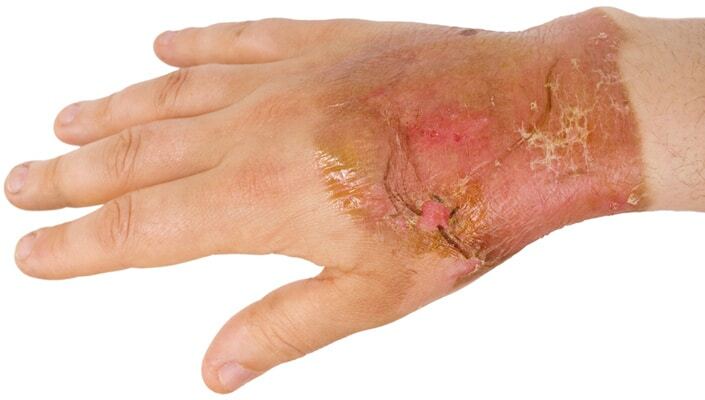 Because of this acid burns tend to be quickly treated which can limit the damage they cause. Strong acids can rapidly dehydrate tissue and will often generate significant heat when in contact with water leading to thermal burns. For this reason emergency showers and eyewashes dispense a large volume of water for at least 15 minutes to rapidly dilute and remove the acid from the skin. 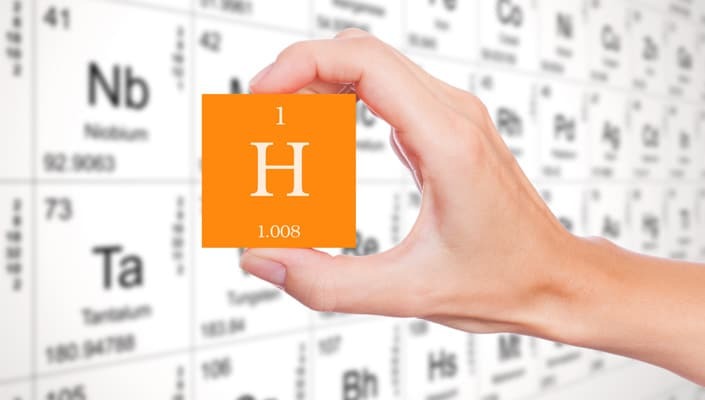 Where the pH is greater than 10 a base is considered ‘strong’ and can cause chemical burns. Strong bases include, calcium hydroxide, sodium hydroxide and potassium hydroxide. Some common weak bases are ammonia and sodium bicarbonate. Chemical burns from bases do not cause as much pain as acid burns, but the damage can be more extensive. Bases can also react strongly with water, and the reactions of several bases with water are exothermic, meaning they give off heat. Bases also react with oils on skin and fatty tissue, which can lead to extensive damage to skin and subcutaneous tissue. Burns from alkaline substances are also harder to treat than burns caused by acids because exposure is not always detected quickly. Bases feel slippery and can be more difficult to remove from the skin than acids. Again, extensive flushing with and emergency shower or eyewash is required to dilute and remove bases from skin. No-one wants to have to deal with a chemical burn as the symptoms can be painful and the damage permanent. Using the correct personal protective equipment including appropriate chemical coveralls, chemical gloves, eye/face protection and respiratory protection is a must. It’s also vital to ensure that first aid devices such as emergency showers and eyewashes are available in the event that an accident or emergency occurs. For advice on the correct apparel, respiratory and first aid devices to prevent harm from the substances your business is using, contact Dalton International on 0800 323 223, enquiries@dilnz.co.nz or via the website.